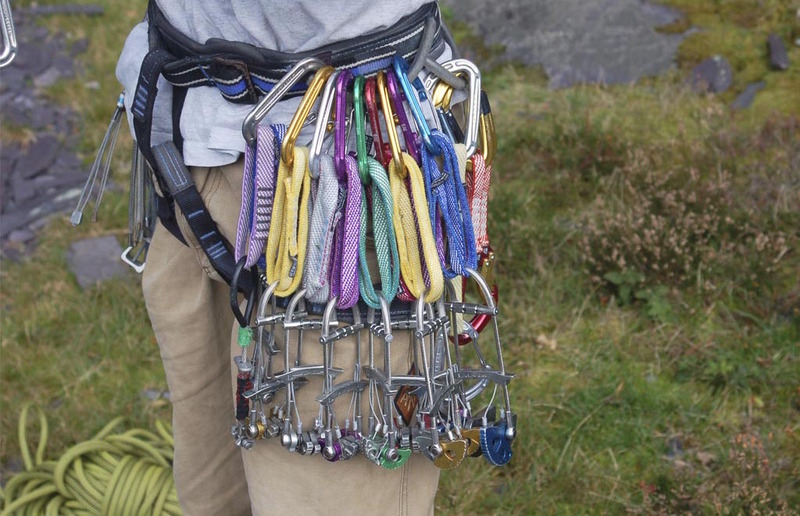 Camming devices are one of the more technical pieces of climbing equipment. They are so effective that very quickly after they were invented they revolutionise rock climbing. Originally design by an aerospace engineer Ray Jardine, who was also a keen climbers. When he was testing his prototype he used to say he was going climbing with my ‘friends’. He licensed the design the wild country and the name ‘friends’ was kept and still is. The name friends is as synonymous as camping devices or cams as name for this devices. Good and bad placements of camping devices. Over cammed, just right and under cammed. Essentially there are several cams that are spring loaded and when placed in a crack they expand. As the device is loaded the cams push out on the crack with a great force than is trying to pull it out so it stays in place. As such camming devices are active and can put a large forces pressing the crack apart. This means that if the crack is part of a superficial flake it can prize it off in the event of a fall. As such the cams need to be placed with consideration. However as they can be placed quickly in a variety of width cracks and even hold in parallel sided cracks means they are extremely popular.